The burger bandwagon rolls on and on. We have seen the rise and fall of hot dogs, ribs, and burritos, but the popularity of burgers never seems to die. While we have compiled our own lists of where is best in Galway for fish and chips (Hooked ), the best sandwich (Entrepans ), pizza, fries, coffee, and more, for a long time even though almost every menu in town has a burger listed on it, there is none that really stands out from the crowd. We have seen everything from burgers topped with plastic cheese on a white squishy bun to ponced up pork and chorizo burgers on a Waterford blaa - but none of them has been 'The Best' burger. Lists often circulate on the internet titled along the lines of '10 best burgers to eat in Ireland before you die'. While one Galway burger will often make the cut (mostly for geographical fairness ), we all know it is nothing more than a pity listing and in reality we do not have anything to compare to Bunsun Burger in Dublin or Coqbull in Cork. The best burger that Galway has ever known was from Scotty's Grill on Middle Street back in the nineties. Forgive me if I'm showing my age but a side order of nostalgia makes everything taste better. Since then, even as the food scene in Galway goes from strength to strength, we have continued to struggle in the burger department. But the last year has seen some improvements, starting with the mainstream launch of Supermac's 100 per cent fresh meat Irish 5oz beef burger, the first fresh meat burger available in a quick service food chain in Ireland. Then the rumours reached us of an excellent burger at the Chili Shack on Abbeygate Street, that I have yet to investigate. And best of all there is the Harlowe Food Truck story. I first came across Harlowe Food Truck at the Galway Food Festival in March; well, it was more of a food trailer. Enda Hoolmaa and Tara Haugh started working on their concept for a burger a year ago. Harlowe made something of a splash on social media and I was curious to see if this was the burger that we had been waiting for. In a food village with some very stiff competition (and some rotten weather ) they were indeed the real deal. A delicious homemade, restaurant quality, burger from a food truck. Since then they have been available only as a takeaway on Deliveroo, working from an upstairs kitchen above Martine's in Quay Street, where Enda is co-owner and Tara had been working for 10 years. They are booked into more festivals, including the upcoming Electric Picnic, and they have the small matter of their own wedding to look forward to in the coming weeks. They started with three burgers, beef only — no chicken, no fish — and one vegetarian burger where the meat is swapped for halloumi cheese. The menu expands to fries, wings, and shakes, but the beef remains at the heart of what Harlowe is about. Some purists argue that a burger must contain a beef patty and that all the rest are actually sandwiches. But whatever the main ingredient is, the Harlowe burgers share one common theme, they are carefully constructed, with bun, filling, and condiments that work together. One of the secrets to a succulent burger is to brush the inside of the bun with clarified butter and toast the bun (so you will need napkins ). They don’t overlook condiments either, they understand that ketchup and mustard are as important to a burger as the meat or the bun, in terms of the punchy flavours they add. They even make their own blend of 'mussup'. The good news is that the best burgers in town are available tonight and for one night only at Harlowe's pop-up in 56 Central on Shop Street from 7pm and everyone is welcome to drop by. The full menu will be available with delicious shakes, chicken wings, and amazing chili topped fries, along with the original Harlowe cheeseburger with American cheese, pickles, ketchup, onion, and mustard finished with a few pieces of crisp lettuce. For €7.50 it is divine. 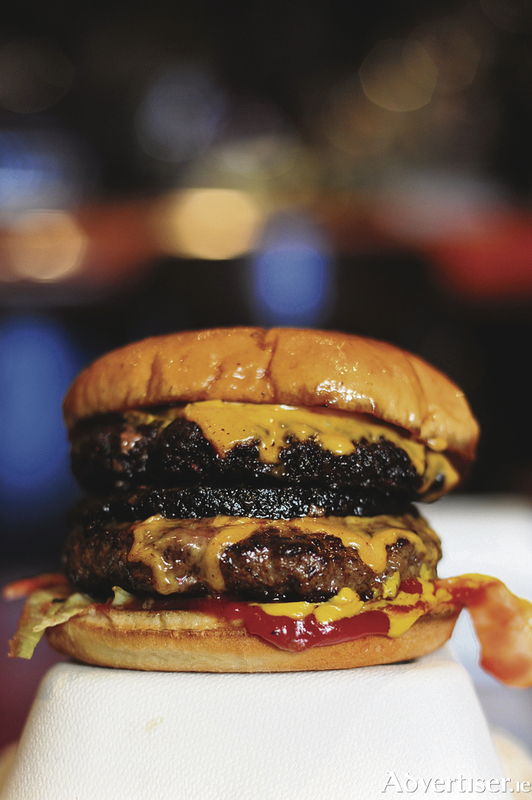 The special burger really is special with a slab of McCarthy's black pudding and all the toppings for €9.50. Don't go without trying the deadly fries, at €6.50 I would suggest this as being a sharing portion, thin cut fries made with maris piper potatoes topped with cheese, jalapeño laced chili, and topped with American mustard. If you want to take part in their Man v Food style chilli challenge, message them on Facebook and they will send you all the details. Harlowe was born out of love for all things Americano and their goal is to bring a taste of a real American diner to Galway. While Enda and Tara continue to look for a premises for a bigger, more permanent, home for their dream diner, those customers in the know, already know it is going to be good. A true American diner with great burgers, incredible milkshakes, and a brilliant atmosphere. My advice is to go tonight, we don't know how long we are going to have to wait for the next one.